It’s much harder to keep up to my blogging schedule now that the nice weather has arrived! We’re spending most of our time outside and away from technology so blogging will definitely be a bit more sporadic until the fall! 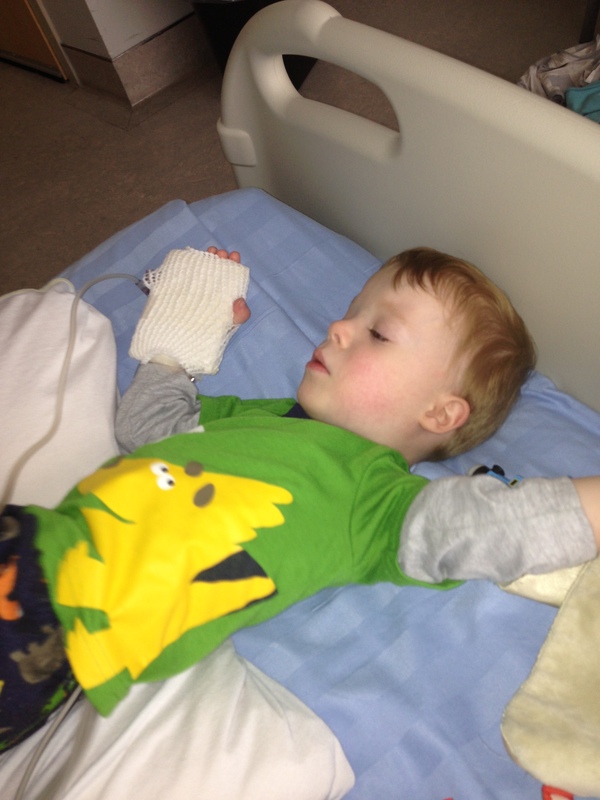 This is a quick update on V and how we continue to deal with issues from his prematurity even 4.5 years down the line. This blog encompasses some newer challenges V faces related to his early arrival and I can’t wait to start sharing yet another one of his successes! Some background if you will: V started school this past January. We made the decision to hold him out for half a year for 3 reasons. We were moving mid-Dec and we didn’t want to start him in school just to pull him out 3 months later! My health issues weren’t going to be resolved until November of last year and unfortunately I wasn’t physically capable of walking him to and from the school closest to our old house. It also wasn’t realistic to expect A’s company to adjust his schedule so he was able to duck out twice a day for a 5 minute walk! V just wasn’t ready in Sept. We may be judged by other parents for this but honestly we know our child best and he was struggling with some skills that made it apparent a few more months at home would only be to his benefit. We’ll get to those later! 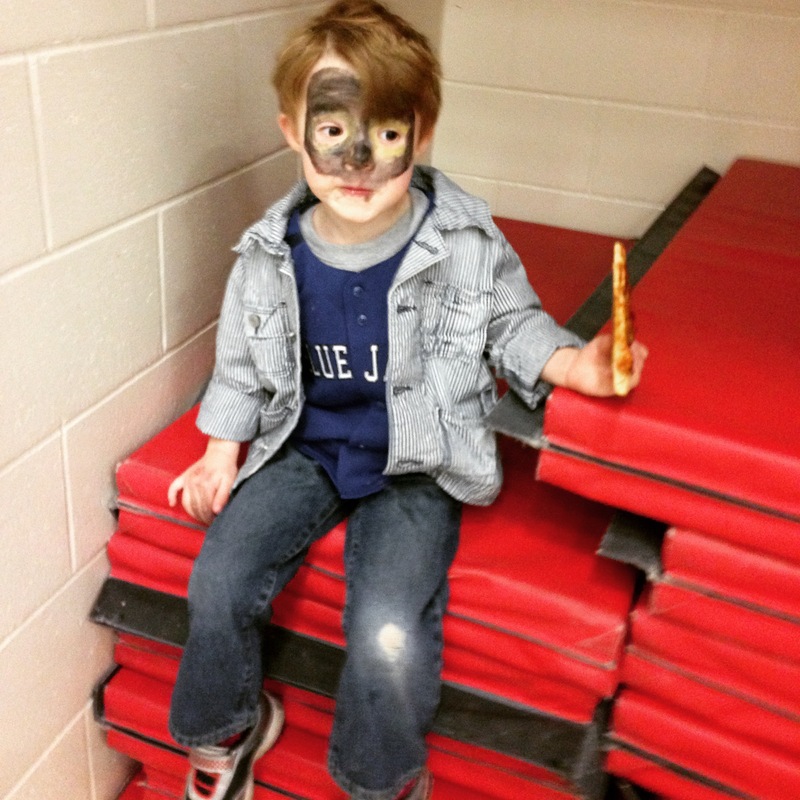 Now V is typically a happy, energetic child who loves to be around people, especially children his age. We knew that socially he would have zero issues going into the classroom but we were a little worried about his health. V was born underweight and, after 4 years of waiting, I’m starting to think this mythical ‘catch-up’ growth just isn’t going to happen for him. His lungs have also taken their sweet time maturing and sadly I think I’ll be hearing the sounds of croup and bronchitis in my nightmares for years to come. When V started JK in January he weighed 29.2 lbs and was healthy as a horse. 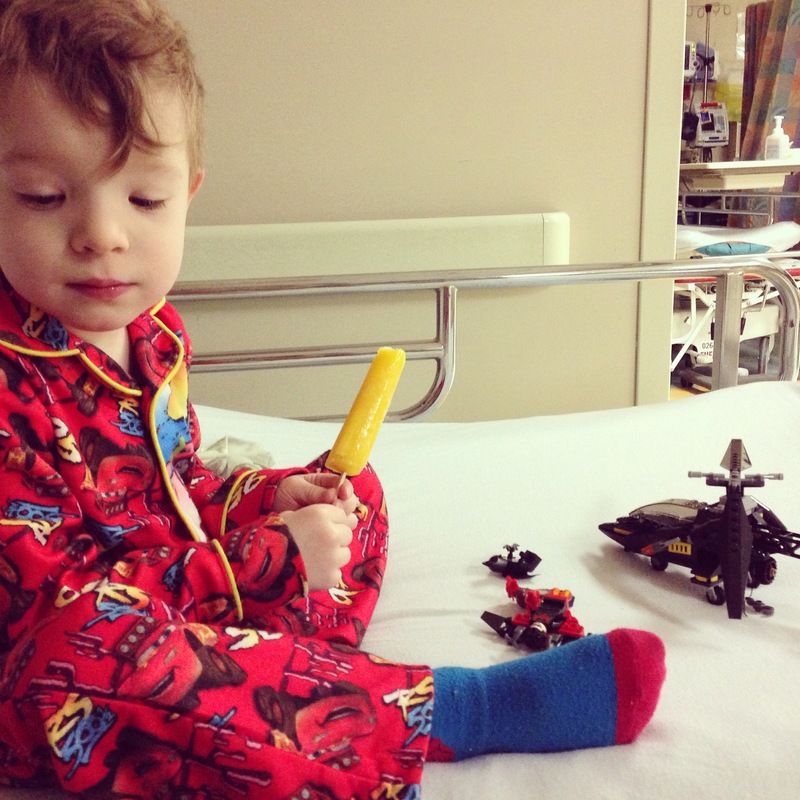 By the end of his first week we were in the ER receiving steroid and epinephrine treatments for croup. In the 5 months he’s been at school he’s had croup at least 5 times, a fever of 105, strep throat, a double eye infection, 2 ear infections and too many colds to count. He actually dropped to 27 lbs (yup that’s a 10% body weight drop!) and was a whiney, snotty mess. It was miserable. 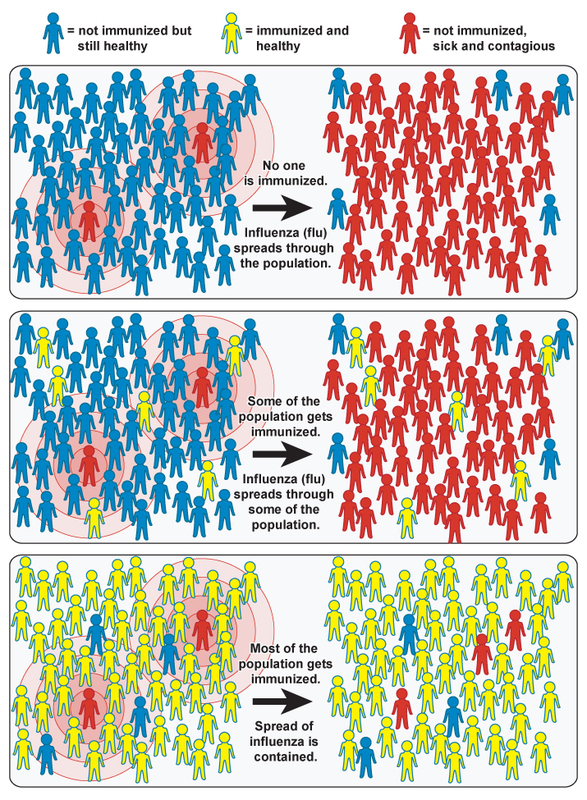 Sadly with his preemie immune system, a regular cold for his classmates kept him home with a fever for days. It’s a good thing I’m on a year mat leave so it wasn’t any trouble to keep him home with me and Baby A! I’m hoping he’ll get sick less often next year but I’m not holding my breath! And I thought my days of worrying about him catching anything were over…apparently a simple cold can still land us in the local after hours! First ER trip after starting JK! Another issue that just came to our attention is that V has some other developmental issues that are setting him apart in class. Since he started in January we didn’t get the typical ‘meet the teacher’ night so during a classroom open house I was fortunate enough to claim a few minutes of his amazing teacher’s time. 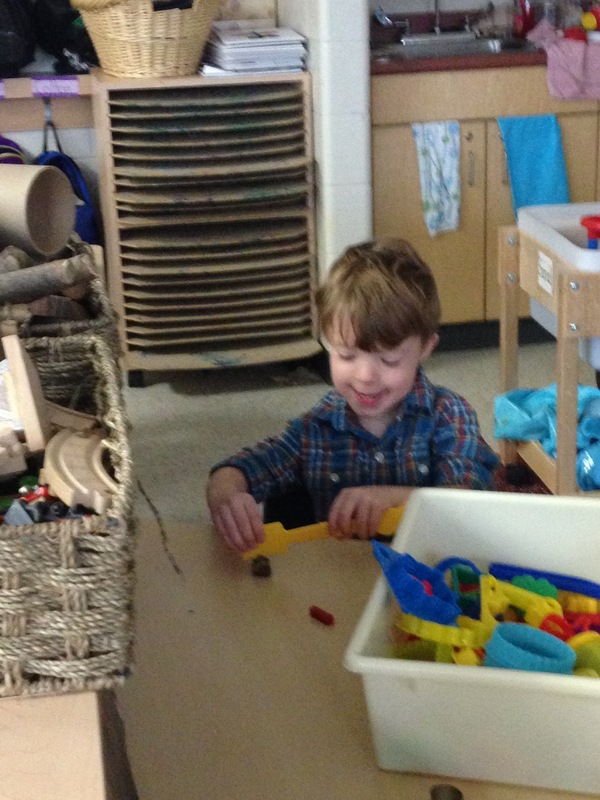 He has a great team in his classroom between his teacher and his ECE who really strive to take the time to focus on each child in his 24 student classroom. She told us that he’s excelling academically which made me so proud! He loves math and has caught up with his peers in literacy. He has a passion for reading and looks forward to library time. Behaviourally he’s on par with his peers. Some days he’s got his ‘listening ears’ on and other days they tend to get misplaced. He is popular with his classmates and hasn’t had any trouble fitting in. He likes chase games and is the first out the door to play at recess! She was really happy with his progress since joining her class. She did have a few concerns though. She asked me, point-blank, if he’d ever had any Occupational Therapy for his gross and fine motor skills. I was a bit taken aback but not totally surprised. When we’d been seen through the Developmental Follow Up Clinic through the NICU at our local hospital they had mentioned that he was a little below the curve in his gross motor skills but never enough to require any follow-up. We had also had him checked at our family doctor around his 2nd birthday because we noticed that V continued to fall more often than not as he walked or ran. We were told it was because he was so tiny and his ligaments in his legs hadn’t stretched enough. This was making his joints loose, causing his ankles to turn in, and therefore causing him to literally trip over his own feet especially when he got tired. We figured he’d grow out of it as he got taller. 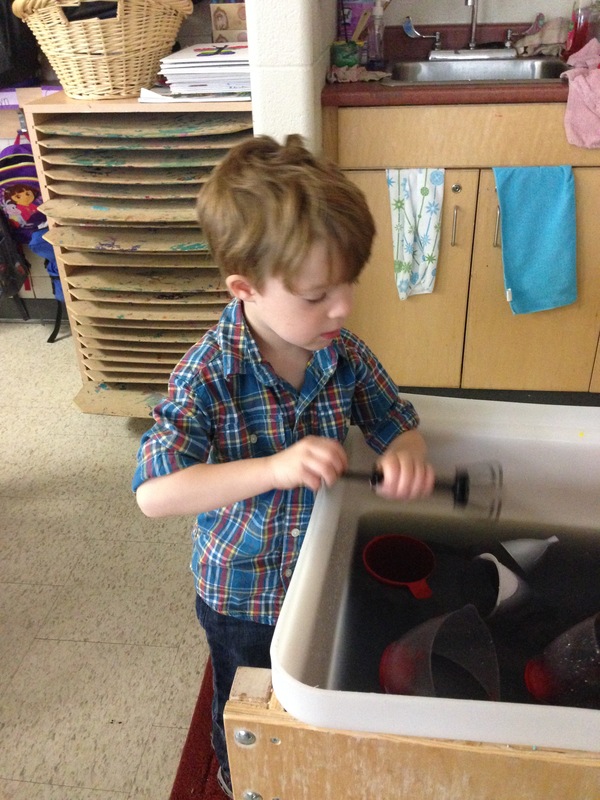 Water table fun in his classroom. Back to his classroom! 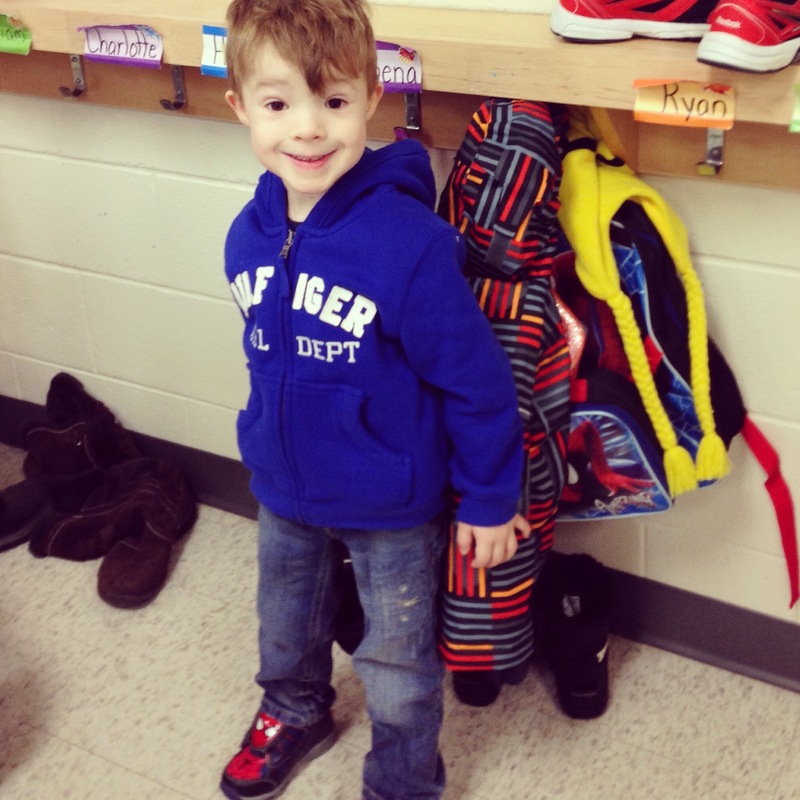 His teacher told me that their classroom OT (who comes in to work one-on-one with another child) had asked her about V when he’d happened to run by her. She noticed that his stride was uneven as he scooted past. The teacher then said they’d done a bit of a closer evaluation and noticed that he was having some troubles with a few things. The gross motor list included the fact that he isn’t able to skip properly, jump rope or catch a ball consistently. 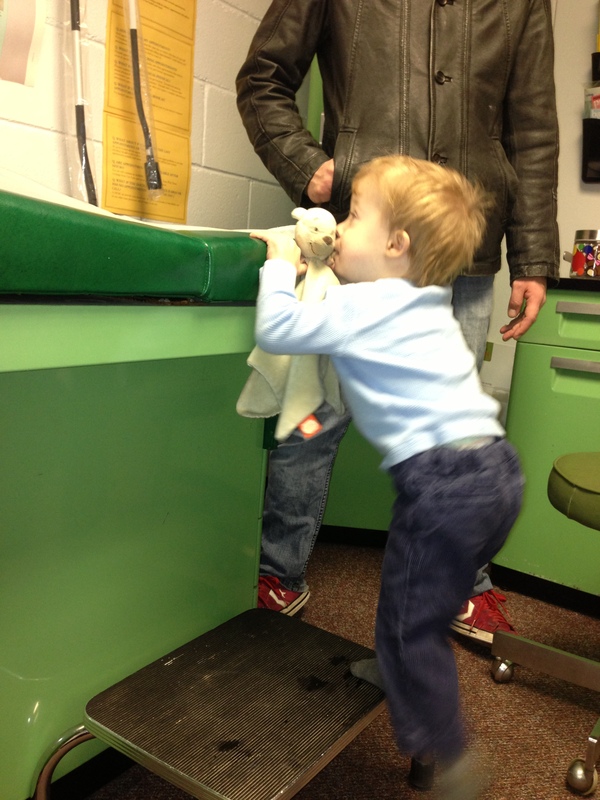 He also was struggling with his fine motor skills. He has issues with the 3 point grasp of a pencil, tracing fine shapes, and cutting along a line. She told me that it was too late in the school year to have OT work with him but it would be something she’d recommend for next year if we were okay with it. Obviously yes! 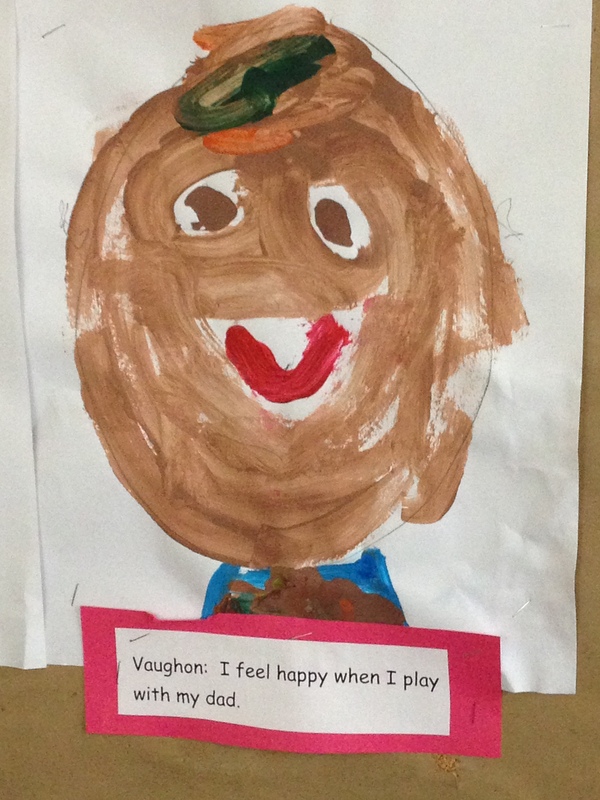 Having spent time teaching myself I know that V’s teachers are going to be an invaluable and well-trained resource for him to ensure his success in school. They are able to interact with him on his level and are able to determine the difference between ‘defiance’ and ‘delay’ which was sadly overlooked in previous relationships. I also understand that early intervention is key for these type of skills and with the right exercises he’ll be back on the level of his peers in no time. When she mentioned all of this I came home and talked with A about it. We also pulled up developmental charts to see where V fell with his gross and fine motor skills from what we’d been able to observe at home. From our end we know that V prefers to each with his hands, struggling to co-ordinate utensils. He also gets frustrated trying to pedal a bike. He can’t co-ordinate the pedals, the steering and watching where he’s going! He can’t do up or undo buttons at all and still has issues zipping up his coat or sweaters. All little things that will come with time and patience if he works on coordinating those little fingers of his! Artwork is a fun way of practicing his fine motor skills too! An ode to Daddy. One big thing though, and the main reason we held him out of school for a semester, was that V was late to potty train. This is apparently a huge indicator for children with gross and fine motor delays and something we never realized until now! It never bothered us too much honestly. I knew he wasn’t going to college in diapers, but we did have others try to tell us that it was a behavioural issue….and we adamantly stood up for our son. We may not have known that it was a motor skills issue, but we know our child best and were adamant he wasn’t still in diapers as a form of toddler defiance. Trust me I know my child isn’t perfect and admit that sometimes he can be whiney or stubborn, but he isn’t a ‘bad’ child which was a label that honestly was thrown in his direction. Now V’s issues are luckily small and fixable. We’re actually waiting for an Occupational Therapy referal and evaluation to see if he’d benefit from appointments outside of school time or if it can be addressed easily next Sept. This situation did open my eyes to the fact that ‘preemie’ status doesn’t end right at 3 when the doctors assure you it does. V will likely deal with some issues related to his post-natal crash, his low birth weight and early arrival for several years but we’re blessed to have a dedicated team who loves and cares for our boy as much as we do! After his rocky start I can say for certain that we can handle anything and come out the other side smiling and stronger! Sadly there have been a few people we’ve lost along the way. It’s definitely hard to keep in touch when you’re bouncing between various specialist/doctor’s appointments or canceling playdates due to a sick child, but we are blessed to know that we have a core group of family and friends who are there for us when we dig our way out from under the pile of blankets and kleenex.